A graduate from the Prague Academy of Fine Arts, Markéta Korečková is one of the female sculptors who entered the Czech art scene at the end of the 1990s. She has found the theme for her sculptures and sculpture installations in archetypally viewed polarity given by the woman and man principle. Somewhat ironically she observes transformations of both polarities in the changing society. Inspired by fairy tales, historical non-fiction, folklore, cartoon, sci-fi, and others, the artist uses and transforms the existing language forms into a new sculpture. The leitmotif is a heterogeneous couple of figures who acquire a symbolic meaning. They are the reason behind any action, duration, ceasing, and renewal of life cycles. 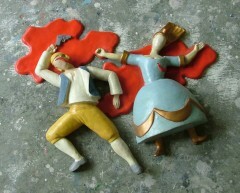 “Prince” and “Princess” are ideal attribution prototypes combining the physical and spiritual ideals. In the non-descriptive geometric form, the central (usually a circle) and the vertical (a column, shaft) form a symbol transcription of the female and male sexuality. The work of Markéta Korečková indicates a dynamic movement taking place inside a sculpture concept oscillating between the female and male principle and/or working with their mutual contrast or, in contrary, fusion. The initial attacking humour and irony the audience feels when looking at the artist’s works later slow down and transform into a sort of hurtful earnestness tackling fundamental questions about the actual form and meaning of existence. It feels as if we were analogically getting through a statue surface into a problem, a trap made up of a tangled spirals and counter-movements, live tissues, swallowing organs, and a flowing sap, into a specified form of something we are trying to remember but probably will never be able to. Korečková is a master of using the contrast strategy. Something along the line of an immediate cooling, fast death, re-start, etc. Behind the upper lightened ironical level there are waiting other unimaginable meanings and association depths.